The story of the famous Roosevelt Luckey sheds starts with a man named Joseph Merwin who found the sheds on his farm in Allegany County in 1938. Then in 1939 Roosevelt Luckey killed the buck that likely shed the antlers the year before. Joseph Merwin kept the huge sheds hanging in his barn for years. Someone saw the rack hanging in the barn and suggested Merwin have the rack scored. The NYS Big Buck Club, founded in 1972, had only been in existence for a few years when Merwin loaned the rack to the club. They were scored and shortly before being returned taken to the Erie County Fair where they were put on display with the NYS Big Buck Club. During the Fair they came up missing, not to be seen again until March of 1994. On March 21, 1994 Lieutenant Robert Lucas of the DEC received an anonymous phone call stating that he would find an "item of interest" tied to a road sign in a remote location of Cattaraugus County, NY. He then assigned ECO Robert O'Connor the job of tracking down and retrieving the item. When O'Connor found the road sign he was amazed to find a huge set of antlers hanging from it. At the time nobody at the DEC new the significance of the antlers, so an investigation began to get to the bottom of the mysterious rack. The antlers were brought to a meeting of other ECO officers in with the hope of getting some kind of lead. At the meeting an officer, ECO Jim Rogers of Niagara County, recognized the antlers as those taken from the Erie County Fair 16 years earlier. Bob Estes, President of the NYS Big Buck Club was contacted to identify the sheds and give details regarding their disappearance. The trophy antlers had been in Este's care when they were stolen and he was delighted to finally be able to return them to their rightful owner. But, the mystery still remained of who had taken the antlers from the Erie County Fairgrounds. ECO O'Connor continued his investigation, talking to as many people as possible about the sheds. The story was then taken to the Jamestown Post Journal, a local newspaper, which ran a front page story and a photo of the trophy sheds. O'Connor later showed the rack to ECO Don Malmrose who remembered an individual showing him photos of a similar huge rack. With that information O'Connor interviewed the person in question who told he had seen the antlers in the possession of a Nick Gumhalter. The stolen rack where taken from Gumhalters home to a party where several photos were taken. O'connor contacted Gumhalter and met with him, where he quickly agreed to a plea deal without ever confessing to stealing the antlers. Gumhalter did however admit to being in possesion of the antlers after they were taken and in the Fairgrounds employ at the time of the their disappearance... and told O'connor that he would tell him the story of the disappearance some day. He passed away before ever being able tell the story. It wasn't until the spring of 1995 that the rack was returned to the widow of Joseph Merwin, who had passed away some years before. Mrs. Merwin later donated the Roosevelt Luckey sheds to the DEC. The enormous Roosevelt Luckey shed antlers are entered in the NYS Big Buck Club Record Book under the "Shed Antler" category. Scoring a whopping 205 6/8" as a typical. 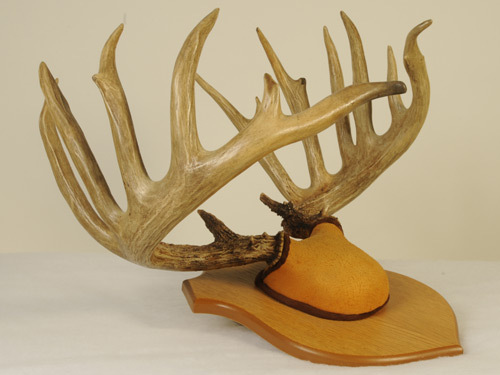 More than 7" larger than the Roosevelt Luckey buck, the owner of the sheds the year before it was killed.